The Glen Helen Ecology Institute has begun to coordinate Antioch College’s sustainability initiatives and is seeking volunteers to help in the launch of the first major sustainability project: the Antioch College Farm. "The College Farm will not only be a food source but also an integral part of the curriculum and student experience," said Nick Boutis, director of Glen Helen and coordinator of College sustainability initiatives. Antioch College’s new curriculum includes a series of Global Seminars that allow for interdisciplinary approaches to the examination of issues and ideas surrounding water, food, governance, health, and energy. The Farm will be an experiential classroom where students and faculty will search for the inherent interrelationships between conscious stewardship, the use of natural resources, and the resultant impact on the health and vitality of the local and global environment. Situated on the approximately 35-acre former golf course on the southeast side of campus, the Antioch College Farm will be a working laboratory that provides the opportunity for active participation in learning, experimenting, and applying best management practices in organic and ecological agriculture methods. 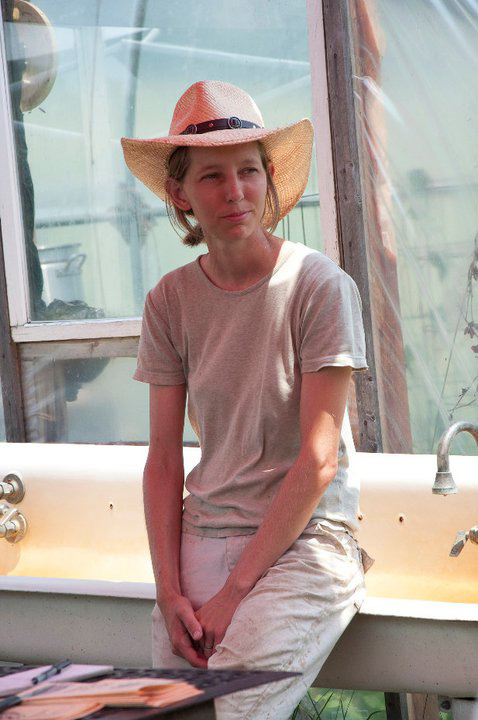 The College has hired local farmer Kat Christen (pictured) to design and implement the first phase of the project. Christen and her husband, Doug, operate Smaller Footprint Farms, a small, diversified CSA (Community Supported Agriculture) farm just outside of Yellow Springs. Christen, who has a degree in life science education with a minor in plant biology, has worked as an urban naturalist for Five Rivers MetroParks in Dayton. SHe is also the founder of City Beets, a summer program designed to create active youth leaders through the process of growing, sharing, and selling food. Working with volunteers, Christen will clean up the old community gardens, establish new annual beds with sheet mulching, prep the new food forest area, and plant fall crops and perennials. Volunteers interested in working on the Antioch College Farm can drop in every Tuesday from 6:00 p.m. to 8:00 p.m. through August. There are some shaded work areas. Please bring your work gloves and water. All ages and experience levels welcome. Volunteers are also needed this fall to construct raised beds and to feed chickens on Saturdays and Sundays. Questions? Weather check? Call Kat Christen at 937.477.8654 or e-mail smallerfootprint@yahoo.com for more info. This idea has so much going for it! I love the way it links into the focus of the new Antioch and has the potential to attract students dedicated to the environment, local food production and sustainability in general. Kudos! It also connects to the history of the college. Agricultural projects are an old tradition at Antioch. Dare we hope for a baseball team?